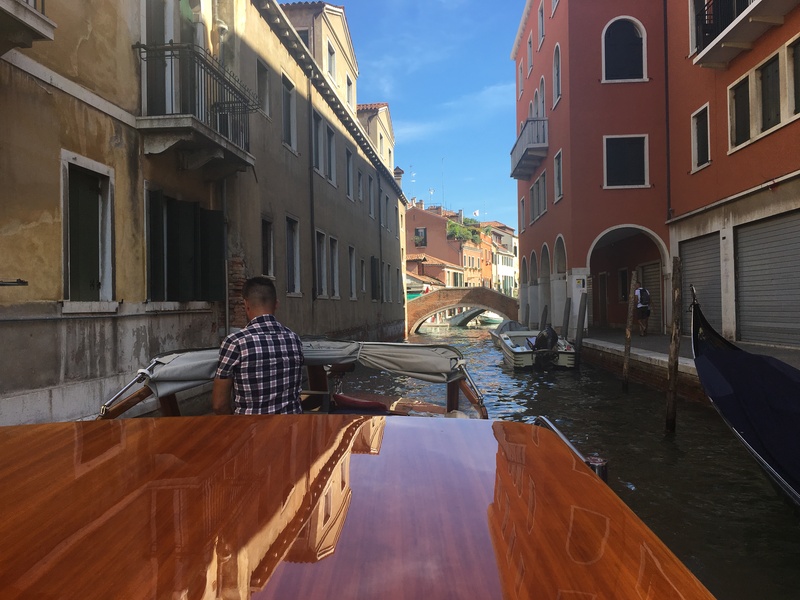 lyndeymilan.com – Another Adventure Begins in Venice! Another Adventure Begins in Venice! For the second consecutive year, I am hosting a cruise and tour, this time of the Eastern Mediterranean. Our merry band of 13, including me, met up in Venice. The fun began as we travelled by boat direct to our hotel! 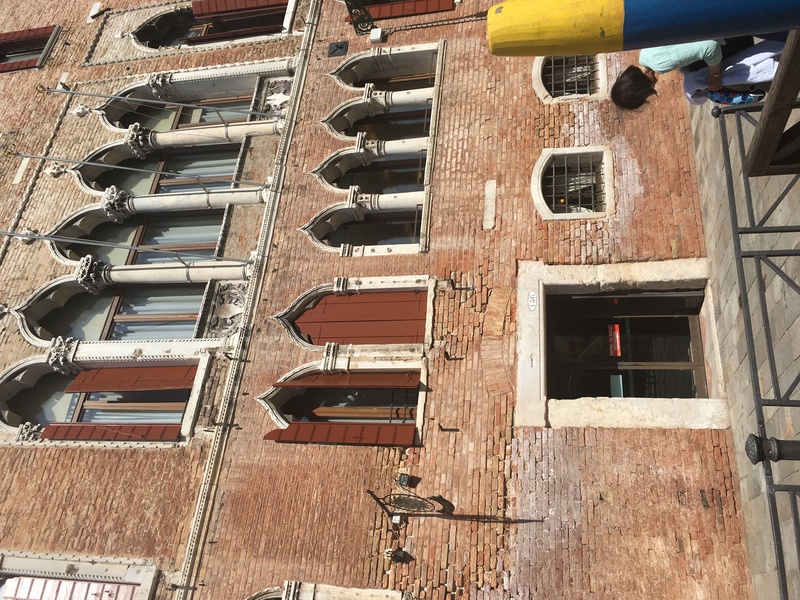 Our hotel was located in a quieter part of Venice, which was perfect. Nowhere is far, it is just that Venice is a maze of labrynthine laneways and canals. It is the capital of the Veneto region, situated across a group of 118 small islands which are separated by canals and linked by bridges. I took the opportunity to have a wander, eat a gelato (compulsory) and get my bearings in the afternoon. Also to stay awake to avoid the jet lag! 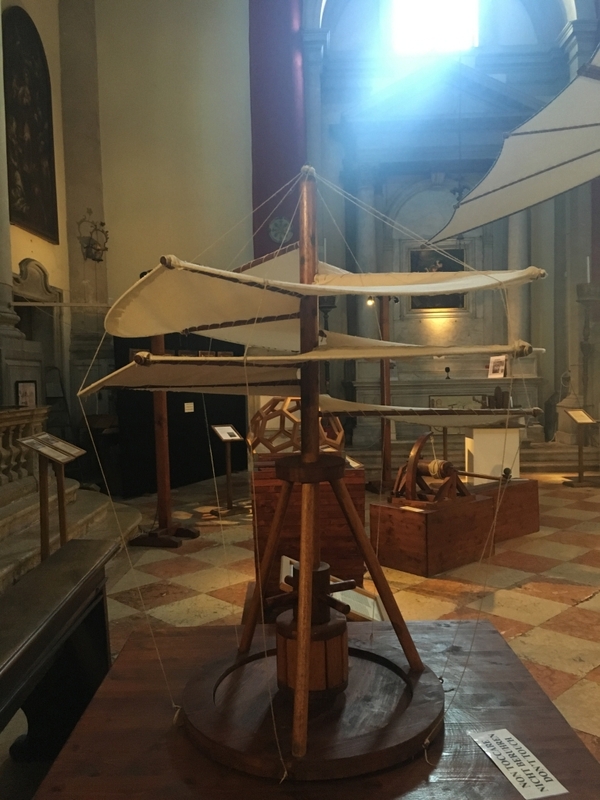 I happened upon a church, Chiesa di San Barnaba which had replicas of the many machines made by Leonardo da Vinci which was incredible. 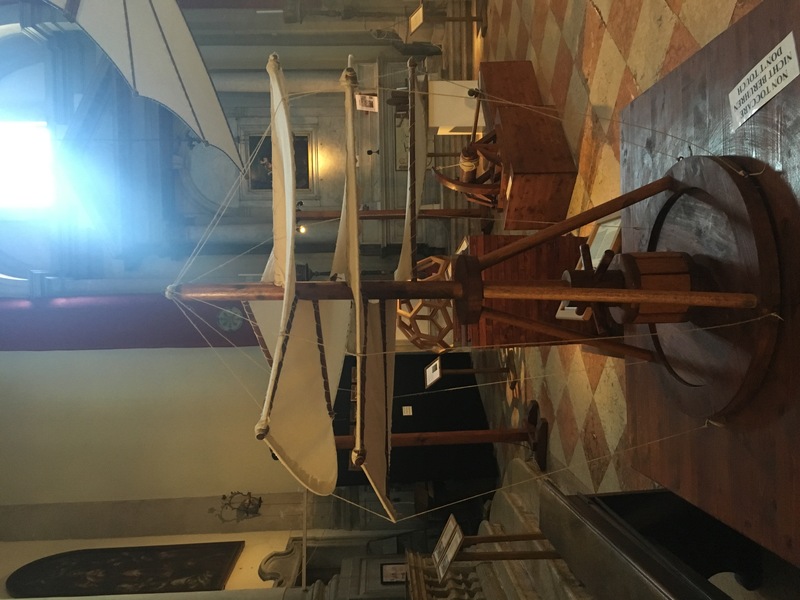 This was one of Leonard’s most famous constructs which is thought to be an ancestor of the modern helicopter. It is a screw with a radius of 4.8 metres, a metal border and linen cover which is set in rotation by men pushing levers as they walk around the shaft or else by rapidly unwinding the rop under the zxle. We ate nearby on that first night at our hotel’s recommendation, Ristorante Osteria ae Cravate, so-named because it used to be a tie shop. 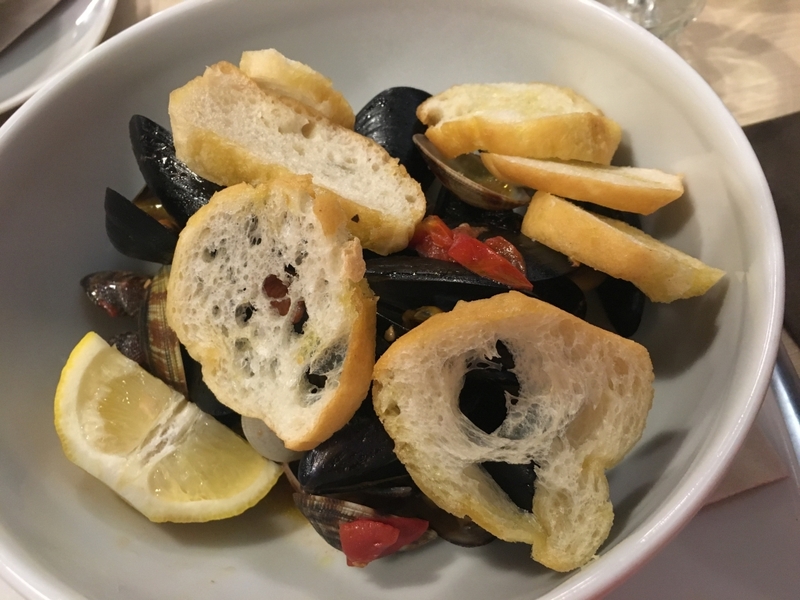 We were surprised to find that it was not that expensive and while I was not impressed with the gnocchi, I was very happy with my entrée of mussels and clams, followed by a main course of grilled scampi. Light and lovely. Next day we had a guided walking tour of Venice. Our tour guide was excellent and lived and breathed the life and the history of this beautiful city. 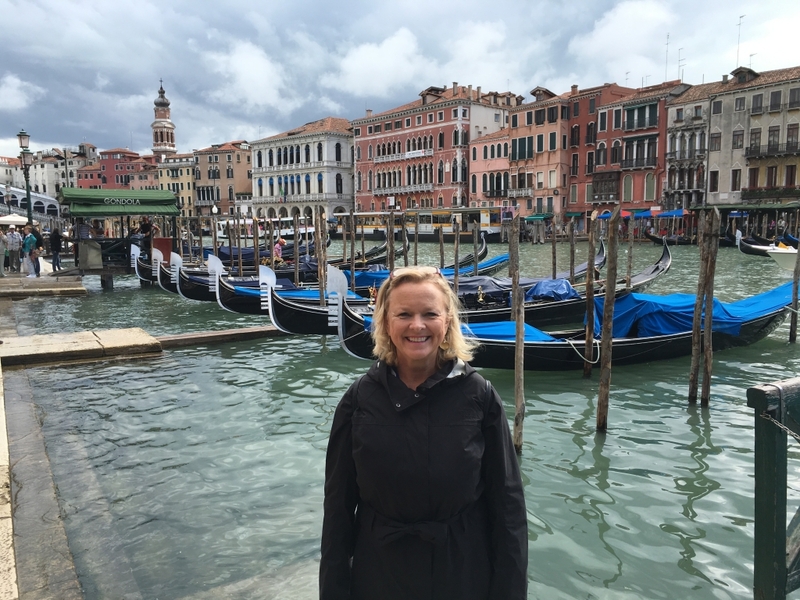 She was a wealth of information and I especially enjoyed her explanation of the extraordinary clock dating from the 1400s in Piazza San Marco. The Torre dell’Orologio is of huge importance, practical, historical and symbolic in the story of Venice. 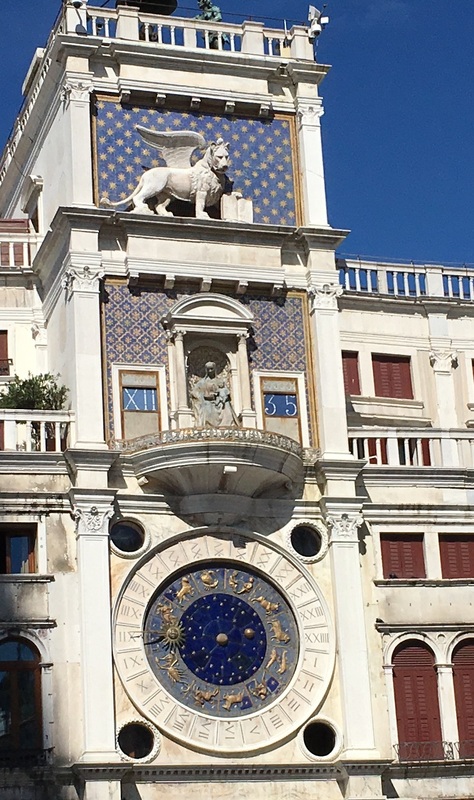 The clock (alternatively known as St Mark’s Clocktower or the Moors’ Clocktower) displays the time of day, the dominant sign of Zodiac and the current phase of the moon – it’s an extraordinarily elaborate timepiece. St Mark’s Square is the heart of Venice, seat of both political and religious power, the commercial centre and meeting place. This showed it was a new moon which in turn means high tides. We were amazed therefore to see water bubbling up from underneath the paving in St Mark’s Square and in fact it caught some people who had stopped to chat with their luggage in tow as they quickly became surrounded. 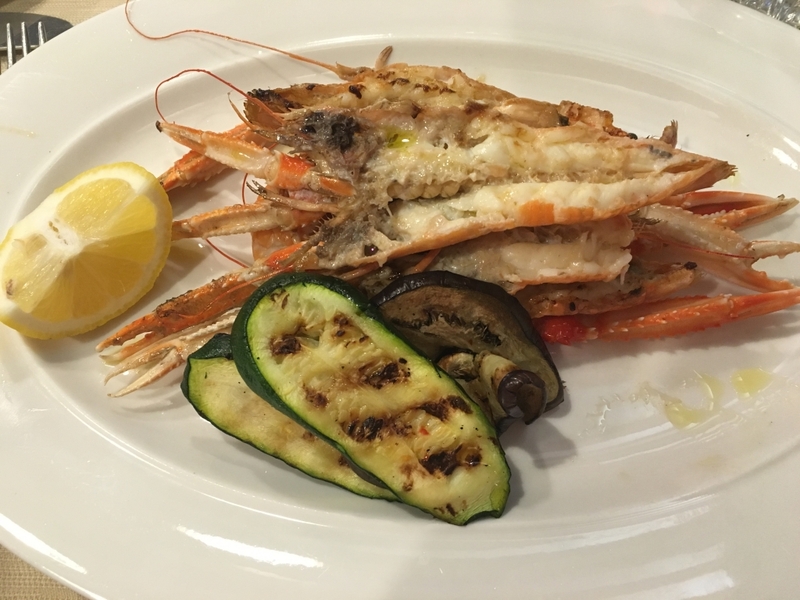 After a cheerful lunch at Enoteca al Volto, the oldest wine bar in Venice, kindly recommended to my by Guy Grossi and some free time, we reassembled later for a quick snack before a concert. 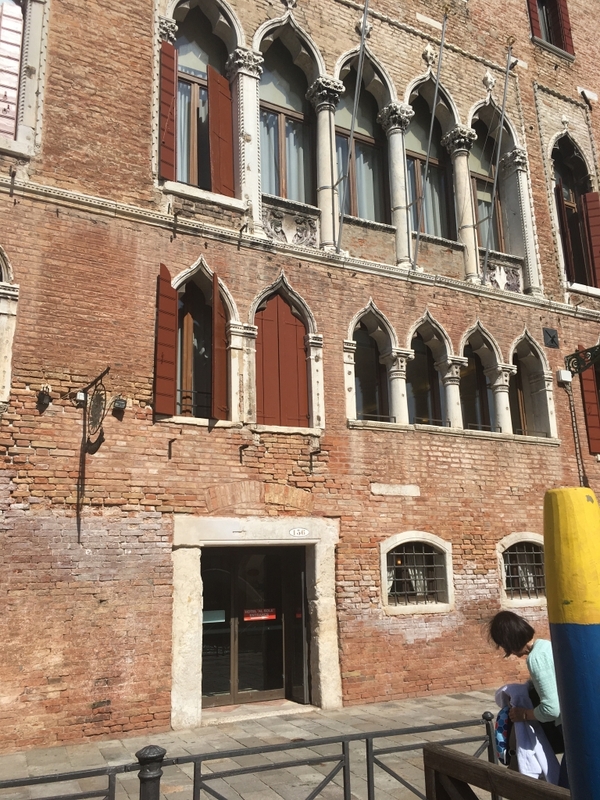 Our guide had pointed out to us an incredible building in the morning Scuola Grande di San Rocco with an impressive upstairs room painted by Tintoretto, the Sala Superiore de Tintoretto. 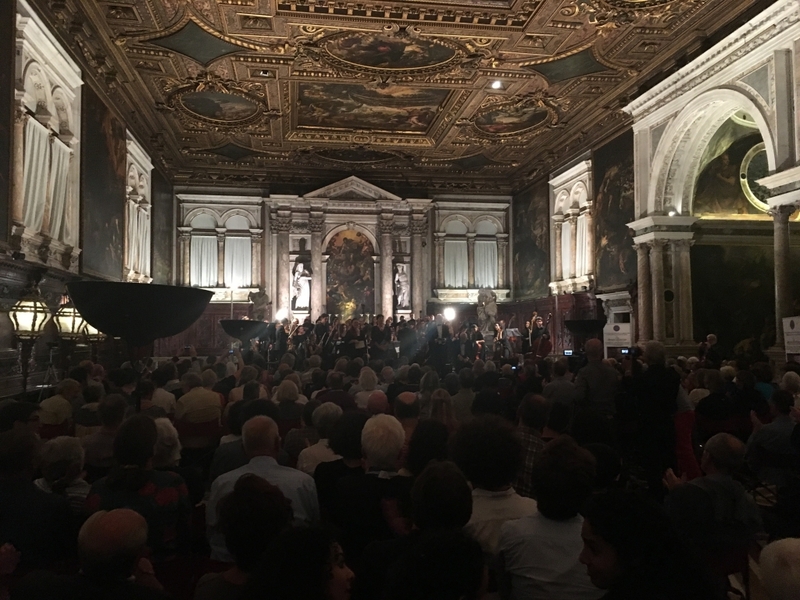 While it cost 12 euro to see this, we saw that there was a concert on in the evening of Wolfgang Amadeus Mozart’s Requiem for an incredibly reasonable 25 euro – so along we went, pinching ourselves at the glory of the music, soloists and room. 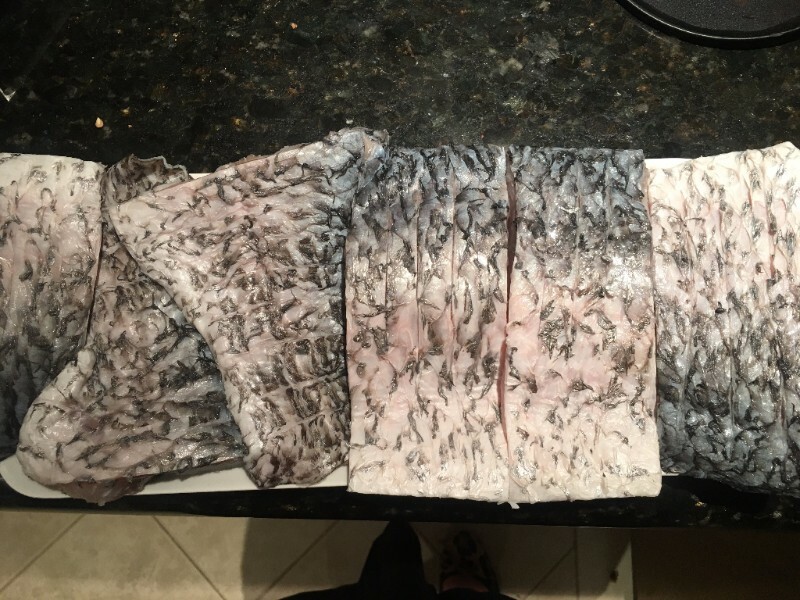 Such a memorable evening.